AS A 270-tonne barge was lifted from the ocean on the new Urangan ship lift, so were the hopes of creating jobs and industry for the region. After months of construction, the $20 million Murphy's Ship Lift ran a test on a Rainbow Beach Manta Ray barge. Until now, the massive barge would have needed to travel to either Brisbane or Cairns for repairs and cleaning. 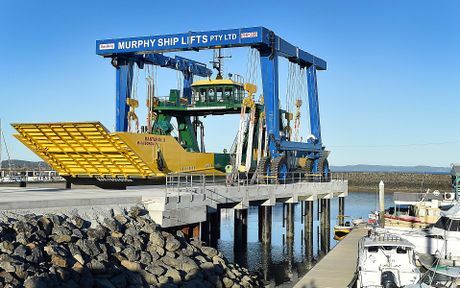 Murphy's Ship Lift director Therese McCrea said because of the high cost of fuel, having a closer lift option for boat owners and operators across the central Queensland Coast was a great, and needed, option. "Hopefully we will become the preferred option for large vessels," Ms McCrea said. "It costs them (ship operators) a lot of money in fuel to travel so many kilometres for repairs of work, so this is an alternative." Part-owner of Manta Ray Barges Kostas Ladas had until now sent his barges to the Maryborough slipway for work. He said given the new option in Urangan also included an undercover area for the vessels being worked on, he would consider it in the future. 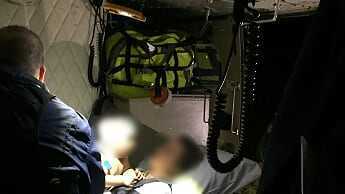 "What they're trying to do now is build a big shed," Mr Ladas said. "So they will drive the barge straight into the shed, so it can be worked on in any conditions." He said this would save his business money, as it would take less time to do repairs or upgrades. The lift has already been booked by a client to be used next week, with other businesses from areas including Gladstone and the Sunshine Coast showing interest. While the offers may have started flowing in, yesterday's test was not such smooth sailing. The barge was initially planned to be lifted during high tide at 10.56am, however due to delays it was not in position to be lifted until after 1pm. As the barge moved closer to the support ropes, the ropes became twisted and needed to be untangled. After another hour of re-positioning, two ropes were tied to the front of the barge to correct its position and slowly pull the ship into place. The barge was finally lifted from the waters of the Sandy Strait at 3.30pm. Over the next four days, the barge will undergo maintenance including the installation of improved hydraulics.